In the last few days she has recently begun saying, "mama"! She says it deliberately now while looking at me, not just as a random noise. I'm so excited! We also caught her sitting up by herself from a flat on her tummy position. She's become very mobile. She's not crawling quite yet but she can roll across the room easily. She is also getting up on her knees and rocking and sitting up on her own with no support. She is very interested in playing with toys and other babies and really loves going to baby yoga. We began Baby-led Weaning a few weeks ago and have been quite successful at it. She didn't show any real interest being fed with a spoon but she loves being able to pick up chunks of food and feed herself! So far she's eating everything from soft fruit and steamed veggies to potatoes in curry! 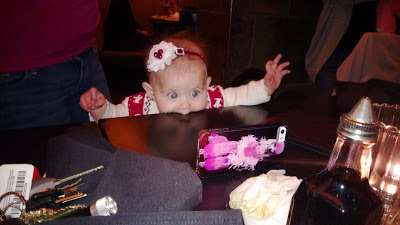 This is a very busy time developmentally for her and, as can be expected, her attitude has changed quite a bit. While she's still a very sweet, happy baby she has become much more prone to fussing. She wants to be held as much as possible and lasts much shorter periods of times in restaurants. She has no teeth yet but we're expecting some any time now. I love watching her grow but I'm starting to think this stage is harder on me then it is her! Thankfully most nights she sleeps in at least 8 hour stretches.